Julius Barnathan was the original behind-the-scenes revolutionary. When he was head of broadcast operations and engineering for ABC, Barnathan’s technical know-how infused the network’s every innovation, from hand-held cameras and slow motion to character generation and closed captioning. Throughout his 40 years at ABC, he engineered creative dreams into broadcast reality and helped jump-start the careers of others who would do the same. Barnathan began roaming the floors at ABC in the 1950s. Barnathan’s understanding of the business allowed him to turn the pipe dreams of ABC Sports President Roone Arledge into broadcast standards. When Arledge wanted to slow down the on-screen action for ABC’s Olympics coverage, he brought the idea to Barnathan. Not only did the engineer create the technology required for slow-motion stop action, he financed it. Arledge and Barnathan were equal partners in ABC’s technical endeavors, working closely to develop the technology necessary to fulfill Arledge’s vision of sports as entertainment. Barnathan made ABC’s coverage the best in the business by creating and implementing such standards as animated graphics, slow motion, instant replay and split screen. One of Barnathan’s most ingenious implementations of the creative process was the long-lens camera he developed for the 1976 Olympics in Innsbruck, Austria. 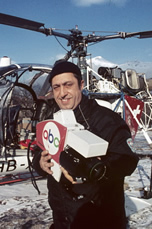 The camera allowed ABC Sports to show the whole mountain during downhill ski races, but Barnathan did not stop there. Barnathan was most proud of his least-acclaimed innovation, closed captioning. The engineer spent eight years developing the technology that made him a hero to the hearing-impaired community. that award stands out from the rest. In addition to his own accomplishments, Barnathan was a mentor in the truest sense. The successful media careers of his three children are a testament to his love for the industry, which lives on through each of the lives that he touched. Lou Siracusano introducing the Jules Barnathan tribute video.